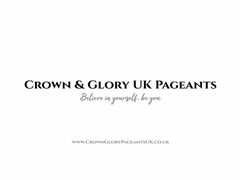 Represent your area at 2019 UK National Finals of Crown & Glory UK Pageants. Crown & Glory UK is a huge National Competition for novice and experienced ladies. 6 UK National winners with stunning full gold round crowns, stunning sashes and a fabulous prize package. 6 UK charity winners for their incredible hard work in fundraising with a beautiful crown and sash. and 1 lucky finalist will be given the opportunity to compete in Barcelona Internationally with their entry and accommodation covered. Q: Do under 18s wear swimwear? No Strictly no Little miss, Junior or Teen can compete in swimwear round or wear something that resembles swimwear - they can only choose sport wear. Q: If I don't raise the most money for charity will I not win? No this is not the case. We encourage fundraising and it is good fun however raising the most does not mean you will win. Q: I have children! Can I still enter? Yes, every woman is accepted whether you have had children or not. We encourage everyone to give it a go. Q: I am married and under 33 years old; what division will I be in? You will still be in the woman division. You can be divorced or unmarried. Q: Will I need brand new dresses for this? No you can get gowns and fashion wear from amazing facebook pages such as Pageant dress sell/swap UK which is strictly for pageant attire and looked after by experienced pageant people. Q: If I don't know what I am doing, will there be someone to help me? Yes! Up until the final day you can ask as many questions as you like. Our director Hannah will be available to help. Hannah is not a judge nor does she have any decision making on a contestants place in the competition, which makes it a perfect position to help everyone as much as they need. Even down to helping choose outfits, sourcing appearances, giving fundraising ideas or just to chat to help the nerves. Q: I am a first time pageant contestant - What are my chances of winning? Have pageant novices every won at their first competition? Your chances are equal to everyone entered. Even against the experienced ladies, if you ask the questions and practice you have the same chance! Yes we have had LOTS of first time ladies win. - Nicky Smith won the very first Miss C&G back in 2013 and it was her very first competition. Apply now to be in for the chance of winning the UK titles or heading to Barcelona - May 2020. All entry fees go to the running of the event to make it all possible and to international prizes. Rehearsals will be throughout the day with the event commencing into the evening. Lunch and refreshments will be provided. Believe in yourself and you can achieve anything.